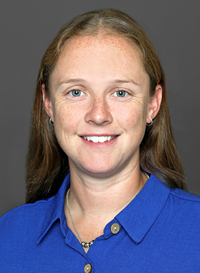 Dr. Amelia Greig is an assistant professor in the Aerospace Engineering Department at the California Polytechnic State University (Cal Poly) in San Luis Obispo. She teaches courses in spacecraft propulsion and the space environment, and leads the Aerospace Engineering Department’s micro-propulsion research activities looking into new and novel micro-propulsion systems for small satellites with a focus on CubeSats. Dr. Greig has degrees in Mechanical and Aerospace Engineering, and Science (majoring in Theoretical Physics) from the University of Adelaide, where she won the Most Innovative Honours Project award for the design, build and test of Australia’s first atmospheric plasma thruster. She completed her PhD in Physics at the Australian National University using experiments and simulations to validate the design of a new electrothermal plasma micro-thruster, known as ‘Pocket Rocket’, designed for use on CubeSats. Outside of work she is a competitive highland (Scottish) dancer, and has competed at events around the World and performed in the Royal Edinburgh Military Tattoo. She also enjoys playing and umpiring field hockey, and exploring America’s National and State Parks on her motorbike.